Two new Diaclones enter the Reboot line: The vehicle Sky Jacket Storm Savers version, and the battle robot Alpha Spartan. Both items transform and include mini pilot figures. This cute little bugger helps Revoltech launch its RevoGeo lineup, based on the amazing variety of living creatures found on Planet Earth! This figure is sculpted with great care and is ready to take part in any fantasy scenes or special effects monster-like scenes you'd care to put it into. Banpresto has released another bounty of loot! Covering Dragon Ball, One Piece, My Hero Academia, Naruto Shippuden, Love Live! Sunshine! !, The Idolmaster Cinderella Girls, That Time I Got Reincarnated as a Slime, Puella Magi Madoka Magica and JoJo's Bizarre Adventure across several figure lines. Sela Mathers, A.K.A Snow White, joins the lineup of Grimm Fairy Tales statues by Zenescope Entertainment. Sela stands about 9 inches tall and features a Bishoujo-style design. Anime and video game fans can enjoy exclusive figures, model kits, and statues from Bandai Japan, FREEing, Good Smile Company, and Max Factory. Don’t miss out on these limited-edition collectibles! With the Captain Marvel Legends Series, both kid and adult Marvel fans can start a legendary collection of comic and movie-based Marvel characters. Each 6-inch scale Captain Marvel Legends Series figure is highly articulated, making them another worthy addition to the Marvel Legends Series. Collect all figures in this Captain Marvel Legends Series Build-A-Figure collection to assemble a Kree Sentry! With the Black Panther Legends Series, both kid and adult Marvel fans can start a legendary collection of comic and movie-based Marvel characters. Each 6-inch-scale Black Panther Legends Series figure is highly articulated and features a movie or comic-inspired design, making them another worthy addition to the Marvel Legends Series. From the Beast Era of the Transformers history, Big Convoy is entering the Encore line. Big Convoy transforms from warrior robot to Wooly Mammoth. These add-on kits from DNA Design, Transform Dream Wave, Perfect Effect, and more can be used to enhance other transforming figures. NECA continues their awesome figure line-ups with Bob Ross, The Goonies, Pennywise, and so many more characters from all kinds of franchises! Hasbro has revealed many items now up for pre-order at New York Toy Fair! With so many titles and series to choose from, there’s something for everyone. 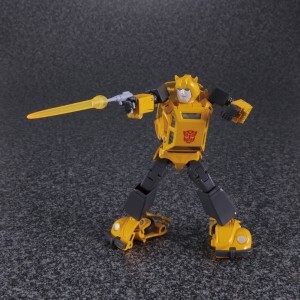 The Studio Series Deluxe 24 Bumblebee figure converts to 1967 VW Beetle mode in 22 steps and the Studio Series Deluxe 25 Bumblebee converts to 2016 Camaro mode in 17 steps. Each figure comes with 2 accessories. Remove backdrops to showcase Bumblebee figures in the California Highway and London Escape scenes. ARTFX Premier is a high-quality statue line that challenges the limits of product development by capturing characters in the highest possible level of detail. First to join the series are Captain America and Thor! These gorgeous statues of Disney and DC characters feature unique details, perfect for collectors of all kinds! Diamond Select Toys has released four new items covering four different line. Black Panther gets a 1/2 scale bust and Mr. Sinister joins the Gallery line; Green Goblin gets a Premier Collection statue while Sandman returns as a Marvel Select figure with several sand form accessories. Kingdom Hearts has come! With Kingdom Hearts III, Diamond Select Toys is offering the second wave of figures based on the game! Each 7-inch-scale figure features multiple points of articulation, and each two-pack comes in display-ready Select packaging, with side-panel artwork for shelf reference. Pop! figures bring your favorite characters, celebrities, and icons to life with unique stylized designs. Each vinyl figure stands 3 to 6 inches tall and comes in window box packaging, making them great for display! Based on his appearance in the thrilling 2018 Halloween movie, Michael stands 8 inches tall, is fully articulated and includes knife and hammer accessories. With the Marvel Legends Series, both kid and adult Marvel fans can start a legendary collection of comic and movie-based Marvel characters. Each figure features detailed articulation, sculpting, and deco, and each one (except Gambit) comes with a piece for the Build-A-Figure of Caliban. Build the ultimate battlefield with Siege figures! Siege plunges fans into the epic fight to survive on the final day of the Autobot and Decepticon battle to control Cybertron. As the Autobot counter-resistance takes on the Decepticon resistance army, the unyielding Autobot army captain and city defender, Omega Supreme, lies in wait—the Autobots’ last line of defense. It's Morphin Time! From the Beast Morphers to the original Mighty Morphin Power Rangers, the Power Rangers have brought teamwork, action, and adventure to fans. The legacy continues with figures, vehicles, collectibles, and roleplay toys from Hasbro, celebrating all sorts of Ranger teams. Build the ultimate battlefield with Siege figures. Siege plunges fans into the epic fight to survive on the final day of the Autobot and Decepticon battle to control Cybertron. As the Autobot counter-resistance takes on the Decepticon resistance army, the unyielding Autobot army captain and city defender, Omega Supreme, lies in wait—the Autobots’ last line of defense. With the Captain Marvel Legends Series, both kid and adult Marvel fans can start a legendary collection of comic and movie-based Marvel characters. Each 6-inch-scale Captain Marvel Legends Series figure is highly articulated, making them another worthy addition to the Marvel Legends Series. Now you can own your favorite DC, Marvel, and anime characters as non-articulated scaled figures, expansive model kits, and beautiful statues from Kotobukiya! These awesome anime and movie figures are available now from Banpresto! Each collectible statue and figure feature special sculpt and paint application, making them some of the most unique additions to any collection. Collect your favorite characters as adorable chibi-sized figures! Each 10cm figure features articulated parts, different facial expressions, and interchangeable accessories. These statues, busts, and other collectibles were crafted with care, hand-painted, and hand-numbered by the artists and sculptors from Gentle Giant’s studios! These Pop-Up Diorama is a must-have for figure collectors! Each Pop-Up allows fans to create the ultimate environment experience for your action figures. You have full control over your Deranged Alley with six highly detailed, seamless connecting panels, flooring and columns. Build onto your MAFEX figure collection with EVA Unit-00 and Newt Scamander! With the incredible MAFEX jointing system, these figures can get into just about any pose you can come up with, and each come with their own accessories from their respective series. Charizard, Mewtwo, and Pikachu from the Pokemon series get POLYGO figure releases from Sentinel! Each Pokemon was designed by New York-based artist POLYGO GRAPHICS and features a unique design that utilizes many flat surfaces to create their forms. These Planet X figures convert from robot to vehicle or beast mode and include weapons and accessories, while the add-on kits can be used to enhance other transforming figures! Each RPJA Helmet is made with HJC’s very own Premium Integrated Matrix (P.I.M. Plus) technology to provide enhanced Shock-Resistant performance, superior aerodynamics, more comfort, and an extremely lightweight shell. From the Marvel film series comes Wasp and Falcon to the S.H.Figuarts figure line! Each articulated figure comes with their signature weapons and accessories to recreate scenes from the movies. Pop! figures bring your favorite DC characters to life with a unique stylized design. Each vinyl figure stands 3.75 inches tall and comes in window box packaging, making them great for display! Vroom vroom, baby; it is I, Deadpool, and my merry hoard of fluffy-tailed friends! All aboard, dirty-pawed brethren! Oh yeah, Professor X is tagging along for the ride, too. With Marvel Legends Series 6-inch scale figures and vehicles, kids and collectors alike can start a legendary collection of comic and movie-based Marvel characters. Princess of the Eighteenth Dynasty of Egypt, Anck Su Namun has been created beautifully in the 1/6 scale, along with Lady Bat. Each 1/6 scale figure is highly articulated and feature seamless bodies for a realistic appearance. These authentic Power Rangers Legacy replicas are full-size recreations of the weapons and accessories of the various Power Rangers series. The Dragon Stars series is comprised of the most highly detailed and articulated figures in the Dragon Ball line! Standing at 6.5 inches with 16 or more points of articulation, these figures can be posed in hundreds of positions. The ongoing collectible series features many characters from Dragon Ball's rich history. Takara Tomy's Masterpiece Series Rodimus Convoy (Rodimus Prime) features great detail and is highly poseable with multiple transformation modes. Accessories included are a transforming trailer, sawblade, Matrix, Photon Laser Alpha, Photon Laser beta, a character card, and a booklet. All text in Japanese. From the Beast Era of the Transformers history, Blue Big Convoy is entering the Legends line. Blue Big Convoy transforms from warrior robot to Wooly Mammoth. The Transformers Generation 1 Starscream and Soundwave statues stand about 30 inches tall and feature each Decepticon warrior standing upon the wreckage of battle. Starscream and Soundwave were sculpted ready for battle with LED lighting in their eyes. Coo Models Palm Empire features 6 inches figures with all the detail of their 1/6 scale figures. Each figure is realistically sculpted while keeping a high level of articulation. These knights are dressed in custom tailored clothing and include a wide selection of accessories. From Joy Toy, each Dark Source figure feature incredible details in 1/18 scale. Each mech and figure include weapons and accessories. Show off your favorite characters with pride as hard enamel pins from CMD Collectibles! Each FiGPiN comes displayed in front of a collectible backer card and is fully capsulated in the clear protector case.